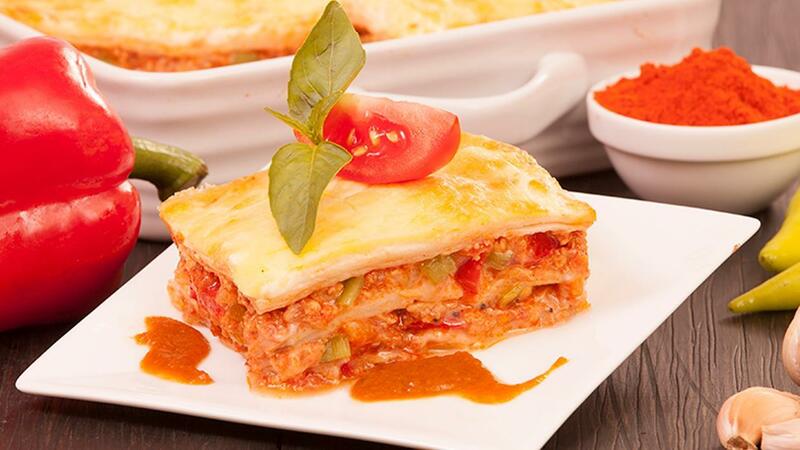 A chicken lasagne with a difference. The sheets are roti instead of lasagne sheets and the filling is chicken with multi-coloured vegetables. A selection of spices brings the dish home to Sri Lanka. Download the recipe below! Mix flour, ¼ oil, Knorr Chicken Seasoning Powder and enough water and knead together to make a non-sticky dough. Break the dough into small balls of the size of a bread rolls. Place the dough balls on a deep tray and pour the remaining oil in just to cover the dough. Well covered the dough tray and keep it for more than 12 hours in a room temperature. Flatten them as much as possible and fry over a pre-heated grill plate till cooked and crisp. In large skillet heat oil and sauté onions, ginger, garlic, capsicums and red pepper until half cooked. Add Chicken, crushed pepper, chili and curry powder and sauté for few minutes. Add Knorr Tomato Pronto, water and Knorr Chicken Seasoning Powder and simmer it for few minutes, adjust pepper and keep it on a side. In a 12inch x 8inch baking tray, spread little cheese sauce on the bottom; then with roti layer, spread with 1/4 cheese sauce, 1/3 chicken, 1/4 grated cheese; repeat the same for another 2 times. Allow the lasagne to rest for 30 minutes before cutting, may be made a day ahead.